Blue laws are those annoyingly inconvenient laws that prohibit you from shopping for certain things on Sundays. Recently the county that I live in in SC repealed their blue laws that disallowed the sale of anything other than food and pharmacy related items before 1:30pm on Sundays. So, not only was the sale of alcohol prohibited all day on Sunday, but one could also not purchase clothes, toys, tools, etc. ; anything that wasn't directly food or health-related. I was elated when this law was overturned here recently, but not just so I would be able to shop for anything I wanted to on a Sunday (though the sale of alcohol is still prohibited on Sunday). Repealing these laws is a step in the right direction as far as the separation of church and state is concerned. Blue Laws unabashedly support the establishment of Christianity. Saturday, which is the Jewish Sabbath, and Friday, which is the Muslim holy day, are not covered by Blue Laws here in America. Thus, maintaining Blue Laws that blatantly push for the establishment of Sunday morning Christian services is clearly unconstitutional. Thankfully, many states have already recognized this and repealed their Blue Laws. Sadly, it took my SC county until 2010 to realize the unconstitutionality of their laws. That is not the end of the issue, though. 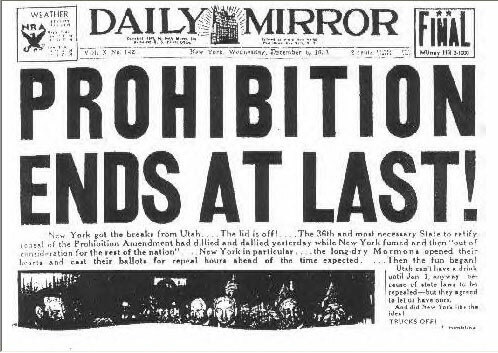 For though the Prohibition has apparently ended, it is still upheld in certain areas on certain days. It is closely related to Blue Laws in that the sale of alcohol is still prohibited on Sundays in many places, or before a certain time on Sundays. Maintaining laws of this nature have explicit religious goals. If not, then why are Fridays and Saturdays not chosen (Muslim and Jewish holy days)? No off-premise alcohol sales after midnight Saturday until 7 a.m. Monday, except in Aiken, Greenville, Spartanburg, Horry County, Colleton County, Richland County, Charleston County/city and Beaufort County. So, certain counties have chosen to write their own laws which do allow for the sale of alcohol on Sundays, but the state-wide law forbids it. This is clearly a violation of the separation of church and state. So, why do I care about this? It certainly isn't because it's an inconvenience for me. As long as their are laws that violate the religious freedom of anyone in this country, the religious freedom of us all is violated. Keeping the government from promoting the establishment of any religion and from violating anyone's right to the free exercise of their religion is a fight worth fighting. Freedom of religion means freedom of, freedom for, and freedom from religion for ALL; not just me, not just you, but everyone.